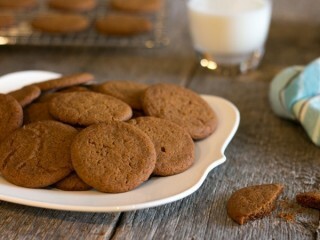 Back in the 1870s, in the coastal city of Malmo, Sweden, a man named Anders Pahlsson baked the first of his soon-to-be famous gingersnaps in a bakery he named Pogen's. In 1970 Pogen's, Inc., opened in the United States, expanding the line of baked goods that Pahlsson developed in the nineteenth century. A legend that dates back many years says that if you place a gingersnap in the palm of your hand, press down in the middle, and it breaks into three pieces, good luck will follow. Today, more than 100 years later, good luck and hard work have made Pogen's the third-largest supplier of cookies to the growing vending business. Update 1/26/17: Bump up the ginger flavor a little by adding another 1/2 teaspoon of ground ginger to the recipe. Also, reduce the cinnamon, so that it doesn't dominate, by 1/2 teaspoon.